I’ve finally gotten into a groove using the multiple trackers and learning how to use their web and app reporting services. Below I’ve provided a spreadsheet that displays several of the data metrics across all of the devices for a single day. I’ve also created screenshots from the web services and apps. I’ll share more updates as my testing continues for another few weeks and will eventually provide a post that will have a detailed summary and comparison. Coincidentally Danny Sullivan began testing all of the same devices as well and today he wrote a post detailing the beginning of his journey. He will be writing posts summarizing his experiences with each of the devices so be sure to check those out. Interestingly enough he has come to the same conclusion as quickly as I have, noting that each of these devices has their own set of pros and cons and no single device is perfect. Choosing one is more about the guidance it provide in having a positive impact changing your behaviors than it is about the accuracy of data. One more thing. 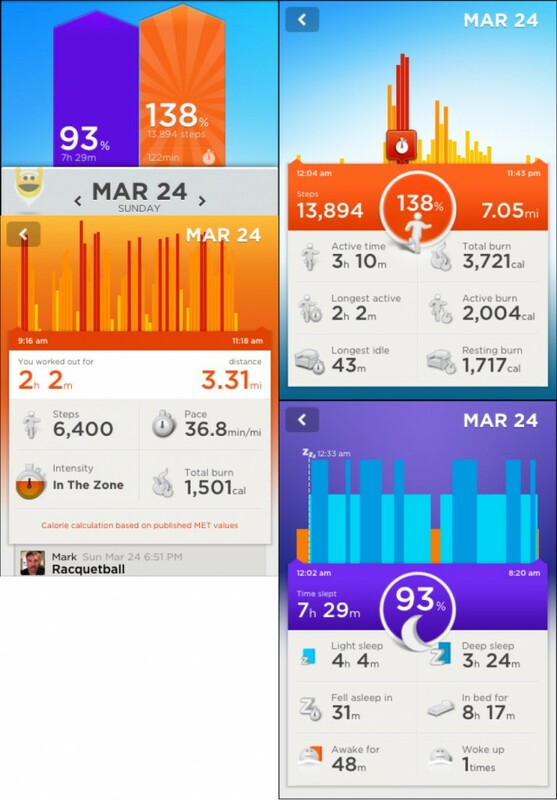 Martin Sona who is a member of the quantified self group in Aachen Germany reached out to me. He told me of someone doing a similar test (link is to english translated post) to what Danny and I are doing but shames us because he’s testing 6 devices at the same time! He’s added the Basis Smartwatch and the Lumoback sensor. Martin provided the data analysis and graphing for that test and offered to do the same for my testing after I’m done. So I look forward to adding that to my summary post as well. On to the numbers and reporting! Note the vigorous activity tracked. 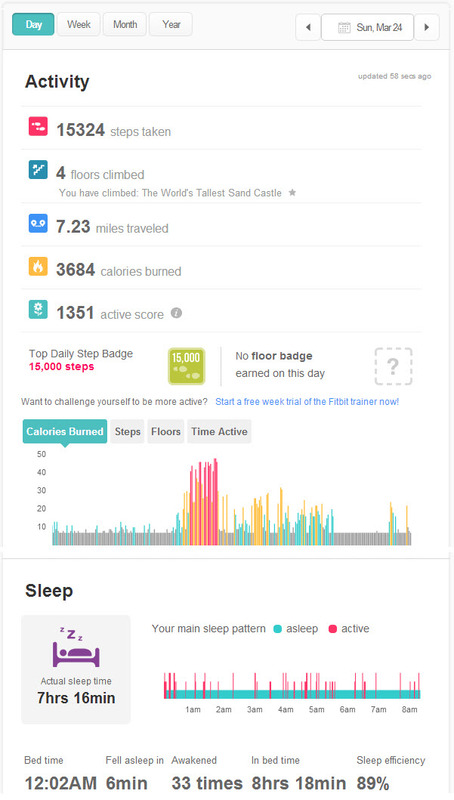 This was done passively by the sensors monitoring my body temperature and sweat. These sensors aren’t available in any of the other devices being tested. 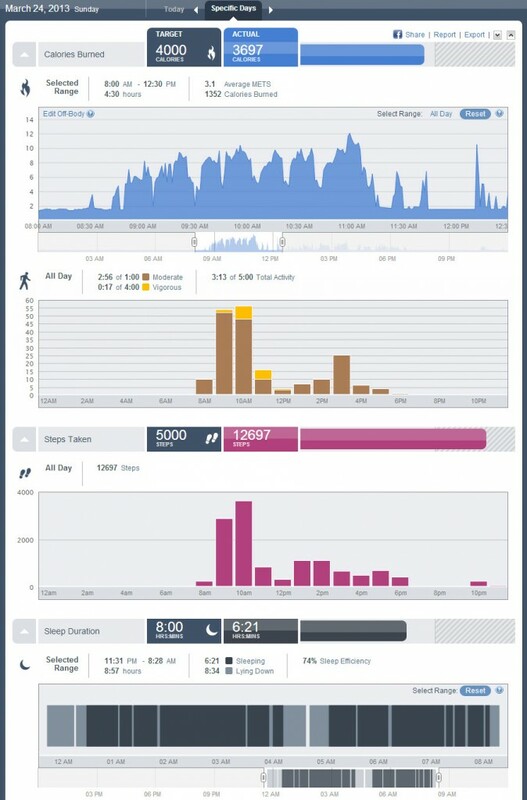 Even without the additional sensors you can see the increased activity in this report where I was playing racquetball. You can also see my movement while sleeping. Here are 4 screencaps from the app available on iOS and Android. Jawbone is the only device without web reporting. 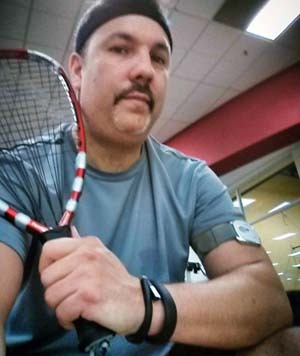 I also initiated my racquetball activity time from the wristband which is tracked on a separate report. The calories burned are also supplemented based on this. In the summary you can see a smiley face with arms pumped up. Daily you are asked “How do you feel” which is then answered with a setting for this. 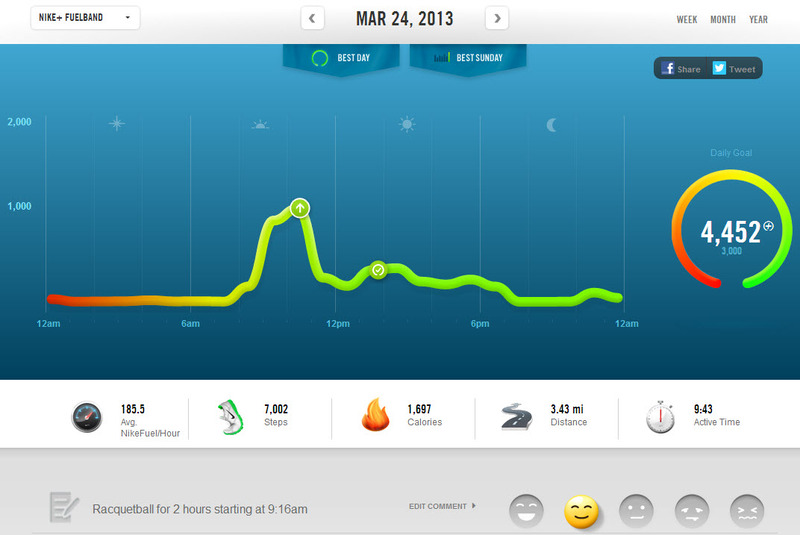 Nike shows when in the day I hit my activity goal. It’s data was also the most conservative by far. I’ve seen this in other comparisons as well which I’ll share later. Just like Jawbone you can provide your daily energy level in the form of this smiley face icon and add any comments based on the day’s activities. Well done Mark, would love to have some of your posts on products comments at http://www.red-dolphin.com ! are you interested ?